Here are some pictures of the finished dress, and the lovely Vicki wearing it on Flickr. Here is my idea for reproducing a sheer dress from the 1860's using Heather's new sheer dress pattern from Truly Victorian. I LOVE striped fabric. The color of the stripe is more accurate on the roll. You are seeing my oak table through the unrolled fabric which is a cotton organza. I will happily do this dress as either a round or an elliptical hoop. Your choice. I think it would be prettiest over white, but would also be attractive over a pale blue. It is a very crisp fabric and takes the gauging well on the sample I played with. The above dress pictured is a ball gown. My thought was to do a day dress, trimmed with a little silk. 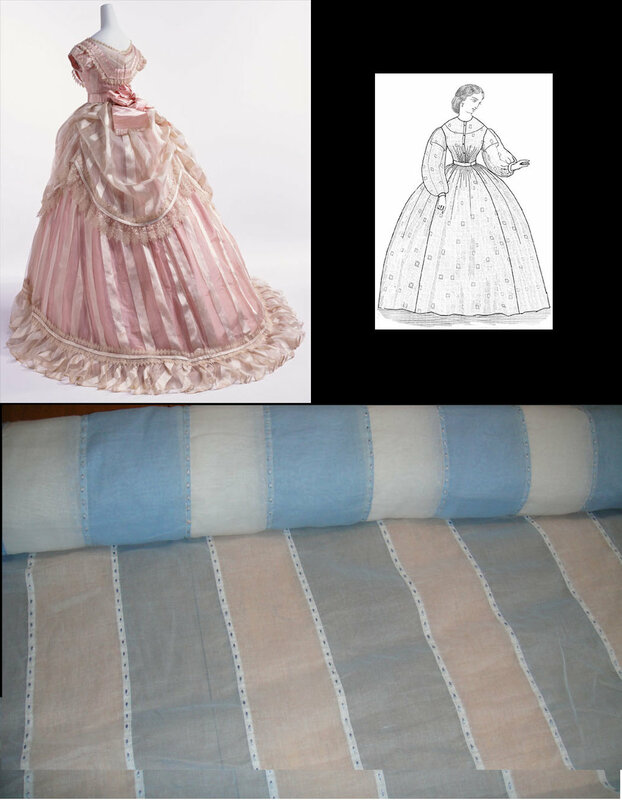 This could also be a fun bustle gown, but the stripes are about 4" wide with an applied strip of organza that is hand sewn and decorated with a small visible hand stitch in blue. If you are interested in adding this to your wardrobe, please let me know, and we will work on the particulars.